You can now create your own carpet of these pretty woodland favourites in your garden! Intense indigo blue colour and sweetly fragrant perfume. Plant them in a shady spot at the base of a hedge or around the base of a tree. This is the most reliable way to get a colony going. 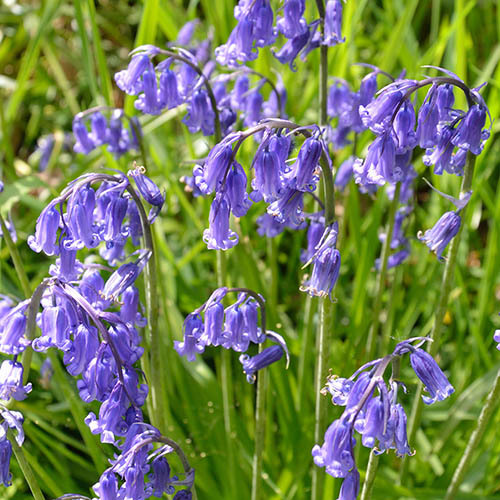 With their intense indigo blue colour and sweetly fragrant perfume, Bluebells boldly herald the arrival of Spring and the onset of warmer weather. You can now create your own carpet of these pretty woodland favourites in your garden. Simply plant them in a shady spot at the base of a hedge or around the base of a tree where they will naturalise just like in the wild. As is the case with Snowdrops, planting Bluebells 'in the green', when they are in leaf and still growing, is by far and away the most successful method of establishing them and is much more successful than planting dry bulbs in the Autumn. Supplied as a pack of 25 plants, "in the green", ready to plant. This is the most reliable way to get a colony going. Please note that the leaves may turn yellow towards the end of the season, and will also do so after planting as they die back underground and prepare for next year. Please plant with confidence whether the leaves are green or yellow!